Though Wang Keping’s early work was overtly political and provocative against the regime, his later, more representational, production has sensuous overtones, drawing inspiration from the shapes of the female body. Using wood as his medium of choice, his sculptural practice constantly seeks formal simplification through massive, though sinuous, volumes and smooth polished surfaces. Keping’s sculptures refer almost obsessively, even erotically, to anthropomorphic forms, especially female, reminiscent of certain primitive Venus figurines symbolising fertility, or of the work of some modernist sculptors, such as Constantin Brancusi. Voluptuous shapes with undertones of lyrical abstraction invariably permeate this sculptor’s entire oeuvre like a vapour. 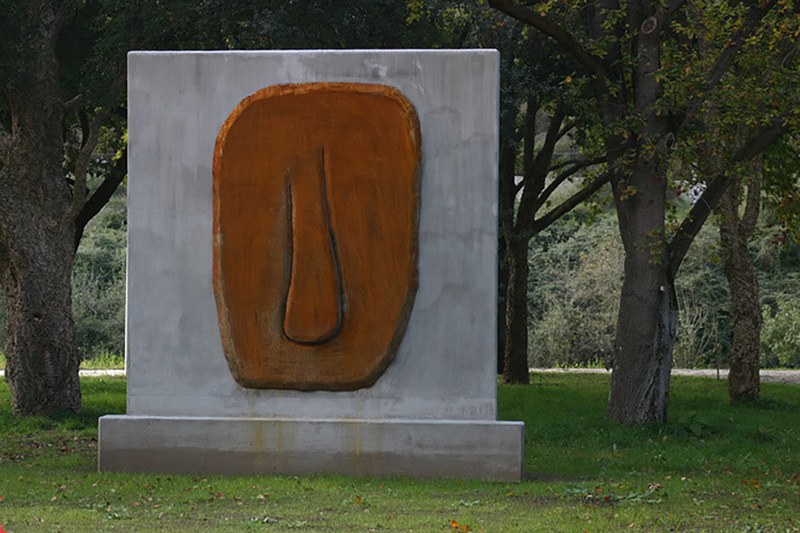 Placed in Rabada park, Duas faces [Two faces] is consistent with the rest of Wang Keping’s production. Allowing for a multitude of hermeneutic possibilities, a big concrete slab frames a metal element, engraved with the drawing of a shape which ostensibly resembles a body part.